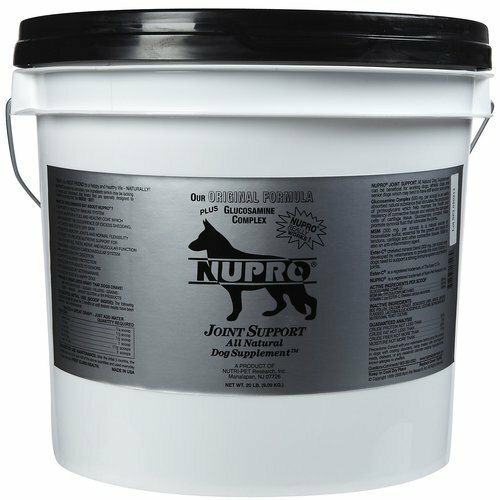 Dog owners claim that Nupro Joint Support has strengthened their dog's immune system and helped arthritic conditions and joint pain. It has also improved their pet's appetite and digestion whil increasing alertness and energy. Ester C (300 mg/scoop) boosts the absorption of MSM (300 mg/scoop)and glucosamine complex (500 mg/scoop), these ingredients promote growth and repair tendons, cartilage and other connective tissues. Other ingredients include Norwegian kelp, ground flaxseed, bee pollen, garlic, and stemed bone meal. Nupro contains no preservatives, sugar fillers, corn, wheat or by-products, it may be mixed with or sprikled on food, or added to water for a great gravy. Initial Daily Directions: Under 5 pounds - 1/4 scoop; 5 to 10 pounds - 1/3 scoop; 10 to 20 pounds - 1/2 scoop; 20 to 40 pounds - 1 scoop (1 ounce); 40 to 70 pounds - 1 1/2 scoops; Over 70 pounds - 2 scoops (2 ounces). After 3 months, these dosages may be cut to one half for maintenance. 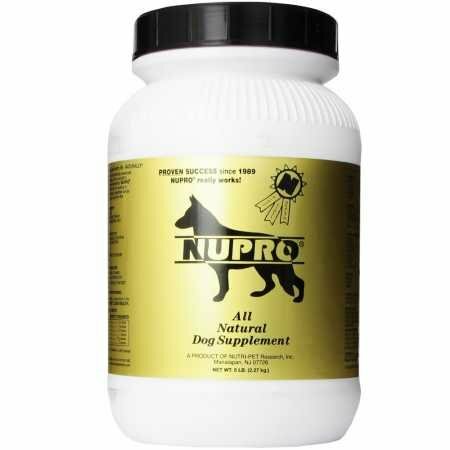 Nutri-Pet Research Nupro Gold All Natural Dog Supplement, at Only Natural Pet Store, holistic product researched and developed by a nutrition doctor that replaces the vitamins, minerals, and digestive enzymes that a dog does not get from his processed food It is excellent for all breeds and all ages from puppies to geriatric. 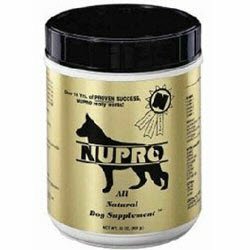 Nupro All Natural Dog Supplement is a scientifically balanced formula rich in vitamins, minerals, amino acids, enzymes and essential fatty acids. Nupro provides the necessary fresh, raw ingredients lacking in cooked and processed foods. Developed and researched by a nutritionist, Nupro uses the finest natural ingredients to support a healthy immune system and condition your dog from the inside out. Nupro contains NO wheat, corn, fillers, preservatives, sugar, grains or by-products. All of Nupro's ingredients are compatible with premium food or the B.A.R.F. diet because Nupro is providing the raw nutrients to both, making your job of feeding the best that much easier! 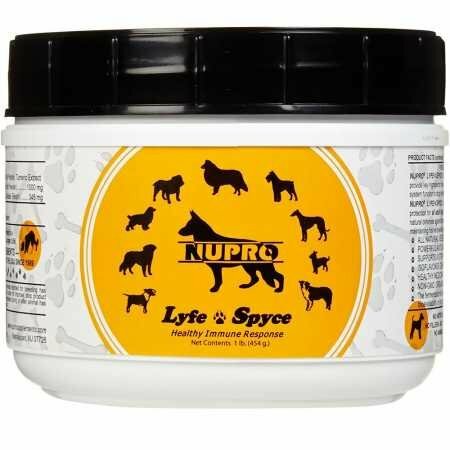 When mixed with water Nupro makes a delicious gravy that your dog will love. 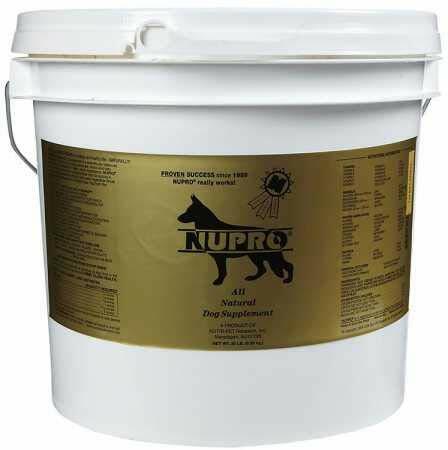 Nupro All Natural Dog Supplement 5 lb.